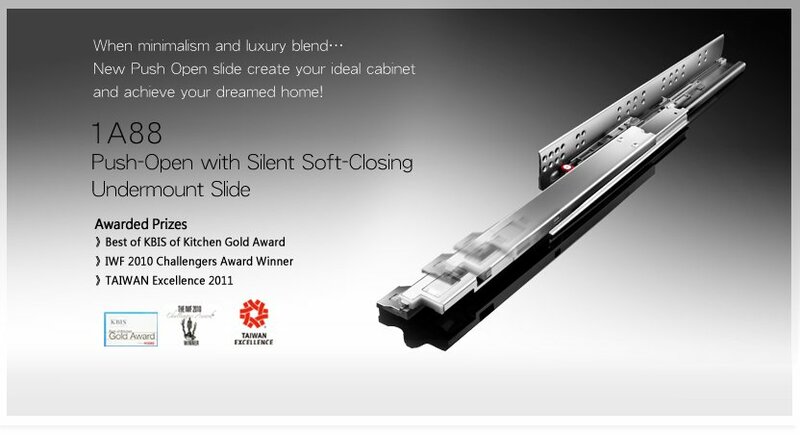 New Push Open slides create the ideal cabinets for achieving your dream home! King Slide makes the Push Open + Soft Close feature come true. The whole new non-electric mechanical design provides easy, whisper-quiet, push-to-open and gentle soft-closing motion without using electrical power. You can simply enjoy the great convenience and satisfy your aspiration for energy saving. We look after your living style as much as we care about our planet; therefore, we have been devoted to developing green products such as non-electric slides in order to protect our earth. King Slide provides limitless design possibilities with its innovative furniture hardware. The undermount push open + soft close slide is the hero behind the scene to create high quality home living with maximum design versatility. The concealed drawer design ensures the perfect surfaces of your cabinetry. Just relax and feel the excellent running performances and comfort that King Slide presents to you. King Slide's undermount push-to-open slide is the perfect solution to make the most of a small space either beside the TVs or under the sofas and coffee tables. The design of handless drawers by adopting King Slide’s cabinetry drawer rails creates the extra storage for books and magazines. Create a zen bedroom with soft lighting, comfortable beds, and King Slide’s drawer runners. The smooth motion of King Slide 1A88 undermount push-to-open and soft-close slide prevents the drawers from slamming to provide you a silent and relaxing bedroom environment. King Slide offers optimal design choices for modish furniture designers and interior designers with the possibilities of handle-free surfaces, high fronts, or wide drawers. Create a versatile minimalism corner by maximizing the space under the sofa or bed, and you will have the spaces to store your umbrellas, bags, clothes etc. The mechanical design automatically opens the drawers with just a light push to access what you need.